What was the role of the Blacksmith in medieval society? The position of the medieval Blacksmith or metalworker is often innately connected with that of the knight for whom he is immortalised as supplying with a steady stream of swords and weaponry. 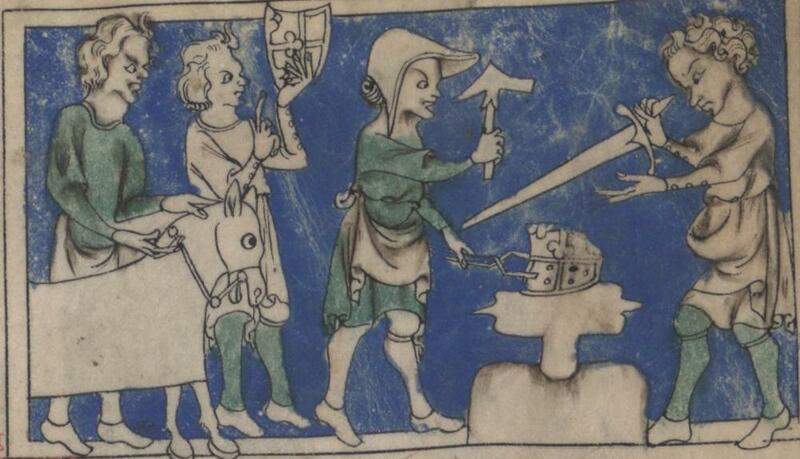 To accurately describe this trade in the context of the medieval period, the blacksmith must be detached from the knight and analysed as a separate entity. Essentially, it must be asked ‘what was there in the life of a blacksmith aside form hammering out swords for lords?’ What sort of world did he inhabit and what were the rules he had to play by? Far from the perception of them as creators of exclusively weaponry, there existed a bona fide trade industry and a conscientious effort to create an administration to preserve it. This article will focus on the other aspects of the Blacksmith’s life, it will show that there was a complex industry surrounding who was able to become one and how they maintained their craft throughout the changing medieval world. The records of the Emperor Charlemagne (d. 814 A.D.) extol the virtues of his black and metal smiths. A capitulary from 802 stipulates that lords must have these workers to produce chainmail for them on military campaign. It was, as a direct result of this exposure to conflict that the smiths were able to innovate and receive the most praise form their feudal lords. Charlemagne’s retinue were particularly impressed with the horse-shields created for them which would have afforded them even greater superiority in battle. It is easy to view these records as confirming the Smiths’ commitment to producing the tools of war and to the sole employment of the lords who directed it. It must however be observed that the records of Charlemagne records pertain to warfare and as such, will reflect his emphasis. His tenure as the King of the Franks from 768 A.D. and later as Holy Roman Emperor from 800 saw him expand his territory with unprecedented success and maintain the loyalty of his nobles by promising the riches of annual summertime invasions into enemy territory. With such a heavy emphasis on conflict to establish and maintain his crown, it is no surprise that blacksmiths are recorded primarily as catering to this. Here we see the conception of the Blacksmith as a primarily a producer of arms and armour that was to endure to the present day. Charlemagne did however, recognise the other values to smiths to the extent that smith-produced goods such as armour and plate were amongst items he counted as Wergild. This was a price placed on every item and living being within his domain, it was the price that thing or person was worth if killed or injured and had to be paid by the guilty party. For example, the Lex Ribuaria records a ‘good breast plate’ as being valued at ’12 solidi’. This process required the intervention of a court to determine the outcome and clearly places the work of smiths as being viewed as of physical value to the empire and as being able to serve a legal purpose. It was in this sense a type of currency in that it incurred financial discomfort to those who stole it or were forced to offer it as compensation. While we have discussed the inception of the Blacksmith as a weapons producer under Charlemagne, it is important to note that they were recognised as having other uses with regards to what they made. As a result, the Blacksmith became a highly valuable member of the lay society as they had the means to produce items of such value. It also crucial that this tradition was in existence at the same time as the wars of Charlemagne and so the Blacksmith never existed as either weapons producer or valued member of society but as both simultaneously. Away from the battlefield, the smith learnt his trade form a Master, who often employed several apprentices from a young age. Advancement from apprentice to Master was by no means guaranteed and rested entirely upon being noticed as a talented worker who was likely to be worthy of patronage or of lending money to. The Master himself would have been raised through the ranks in this manner, which was designed to forge the best blacksmiths as well as to regulate the number of workers to reduce competition and preserve the prestige of the business. Masters were unlikely to be too lenient towards their apprentices as it was only the master who would suffer financially in turn. It is interesting to note the basic parallels between smiths at this stage and the same process of advancement for young knights seeking recognition. The industry itself, like many others, assumed legitimacy by creating a guild that was administered by the Masters which served the purpose of regulating the number of smith apprentices permitted and the materials allowed. The development of these institutions is important to understanding smithing and metalwork as being a staple part of medieval life because it shows an active attempt to prevent it from becoming saturated or exploited. It is clear that they served a societal purpose that was independent of the production of weapons, hence the attempt to formalise and preserve it. This is was continued consistently into the high and later middle ages as blacksmithing assumed a major position on international trade. Evidence for this lucrative development can be found in the German city of Dinkelsbuhl, which prospered largely on the trade brought in by its Smiths. Further demonstrating the development of blacksmithing as integral to the medieval town and economy was the admission of their elite to positions of authority within a region, such as the town council. This move represents a synthesis of the practice of blacksmithing and metalworking with a legitimacy and recognition. Dinkelsbuhl was one of the first such cities to implement this, granting Smiths the right to stand on the town council in 1387. This official move reflects that the city officials now recognised the blacksmith as an important domestic asset that had uses in international trade and civic development. On balance, the image of the blacksmith cannot be totally separated from the feudal caricature that has endured and this is because despite the establishment of smithing as a major aspect of the regional economy, it maintained a latent ability to provide for the military and this cannot be ignored. However, they also existed as a separate entity with legal, institutional and economic interests. Even in times of wars they performed other functions in society that were no less distinguishing features of their trade.